Much like any other marketing campaign, Twitter shares one critical ideology—maximum exposure. When you tweet, are as many people seeing it as possible? If we put in the effort to carefully craft influential and noticeable tweets, we certainly would want to make sure they are being sent out at the times of day that will have the most impact. A blog post on The Social Media Guide says the best time to tweet, as a general rule, is 9:00 a.m. Pacific time. This is because west coast workers are just arriving, east coast workers are on lunch break, and the work day is ending in Europe, specifically London. If you have that much reach, this certainly sounds like an effective time to tweet. Of course, there are many other theories, studies, and statistics on this topic. For example, this graph posted by Fast Company indicates the best time to be retweeted is at 4:00 p.m. Eastern time. It may be worth taking the time to review tools such as WhenToTweet.com for possible suggestions as to when you personally should be tweeting. If you thoughtfully select who you follow on Twitter, then that may alleviate some of the stress of this notion. If you follow professionals and influential personalities, then someone of value may see your tweet no matter what time of day it is. Take note of when people reply to your tweets and when you are retweeted, and take these figures into account when you are planning out your tweeting schedule. You may want to save certain tweets for these certain times, depending on how much you want it to be seen. A consistent and steady Twitter stream is always your best bet for reaching the biggest audience, but it might work to your benefit if you know when your audience is most engaged. Posted in Engagement, Guy Kawasaki, Influence, John Foley Jr., Marketing, Twitter | Comments Off on When is the Best Time to Tweet? A true relationship has to be earned. It’s about respect and trust. And a balanced relationship is reciprocal. You do something for somebody else, and they do something for you. You exchange ideas. You use each other as a sounding board. For a relationship to last, it has to be a two-way street. Followers on Twitter and friends on Facebook are not equivalent to relationships. Just as in the real world, a true relationship on social media has to go deeper than just a surface connection. Having 5,000 followers or 10,000 friends is meaningless if you don’t truly connect. If you’re not convinced of that, ask one of your Twitter followers for an opinion on that white paper you’re writing. If nothing happens, you’ve got your answer. One of the keys to nurturing real relationships on social media can be found in the manner of your engagement. People want to be valued, and once they feel you value them, they will most likely feel a connection with you—and some degree of loyalty—and will also continue to expect an ongoing dialogue to reinforce those feelings. And you’d better deliver if you expect the relationship to grow and strengthen over time. Successful relationships are also about helping to support others. It’s not all about you, your company, or your agenda. Social media is a community, and as a member of that community, you should not only contribute to it in various ways, but you should also recognize the contributions of others. For example, promoting other people’s accomplishments by “liking” their videos, retweeting their tweets, or sharing their latest blog posts will go a long way toward building connections and real relationships. And don’t let those relationships stop at the keyboard. Get to know your social media connections in the real world whenever possible. Too many marketers jump right in and start using various social media tools and technologies—such as Twitter, Google+, and blogs—before they’ve even developed a strategic plan or thought about how those activities might impact the rest of their marketing initiatives. Don’t make that mistake! Take a little time to determine how to best integrate social media into your existing marketing strategy and mix. It’ll pay off for you. Step one in the planning process is to nail down specific social media objectives, based on the listening activities detailed in Mandate #1. Now that you know what your constituents care about and are discussing on social media, how does that impact the messages you need to communicate to them? Step two is to integrate your social media strategy into your overall marketing strategy to ensure your resources can be leveraged most efficiently and effectively and that common goals can be more easily reached. If you work for a large enterprise, you have two significant advantages over a small business when it comes to planning and budgeting for a social media marketing program. First, your company’s DNA most likely has a built-in “think strategically” strand, and second, it also probably has a fairly large wallet. If, however, you work for or own a small business, you have an advantage as well. You most likely can make strategic decisions and launch new marketing programs fairly quickly. That can be a huge benefit in the fast-paced social media world. Finally, be sure you’re prepared to monitor and measure your impact and progress. Establishing benchmarks and other metrics that can be tracked over time will help you better understand what’s working and what’s not, and thus be able to make whatever adjustments are necessary to ensure the success of your social media marketing activities. Using Twitter for Marketing and PR: Do the Pros Practice What They Preach? 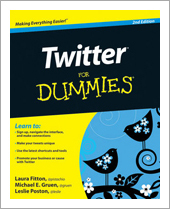 It seems that everyone claims to be a Twitter expert these days. Of course, most are not. But several of the real Twitter pros I know—including those who have written books about using Twitter as an effective marketing and public relations instrument—have figured out how to best leverage the 140-character microblogging tool to promote themselves, their books, their firms, and their clients. And some of them actually follow their own advice! 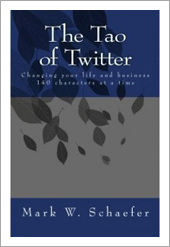 For example, Mark Schaefer of Schaefer Marketing Solutions is the author of the book The Tao of Twitter: Changing Your Life and Business 140 Characters at a Time. He and his firm provide affordable outsourced marketing support to address both short-term sales opportunities and long-term strategic renewal. Mark uses Twitter to help deliver on that promise for a number of his blue-chip clients, including Nestle, AARP, Anheuser-Busch, Coldwell Banker, Scripps Networks, Keystone Foods, and the U.K. government. He also very effectively promotes himself and his book on Twitter as part of his own marketing, branding, and relationship-development strategy. Hollis Thomases is the CEO of Web Ad.vantage. 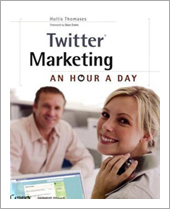 She is also the author of Twitter Marketing: An Hour a Day, a book that offers marketers, advertisers, brand managers, PR professionals, and business owners an in-depth guide to designing, implementing, and measuring the impact of using a complete Twitter strategy. Hollis uses Twitter to generate qualified website traffic that gets converted into actions, leads, and sales for her clients, most of which are challenger brands or large non-profit organizations. And finally, Laura Fitton, co-author of Twitter for Dummies and founder/CEO of oneforty, has been an active Twitter user for some time. She has amassed approximately 80,000 followers and engages with them daily. Laura’s firm helps people get started with Twitter, organize the chaos of their daily social media routines, and connect their social media efforts to their core business to drive ROI. In an environment where fewer and fewer journalists are covering more and more stories than ever before, media members are increasingly taking a “don’t call us, we’ll call you” approach to finding sources and stories to cover. Rather than waiting around to be pitched by traditional PR reps, many media members are looking for their own sources—not only Google and HARO, but Twitter as well—to search for and connect with subject matter experts (SMEs). Book authors and other experts who have built digital platforms that showcase their credentials and provide valuable information on their topics have widened their nets to catch such queries on Twitter. So if you’re interested in promoting yourself, your book, your organization, or your clients, why not use Twitter to your advantage? But don’t jump in without a well-thought-out strategy. Pay attention to the real Twitter pros who are actually practicing what they preach, and then emulate their approach. Posted in Blogs, Branding, Channels, Content, Customers, Demand Generation, Engagement, Google, HARO, Integrated Marketing, Interaction, Journalism, Kent Huffman, Lead Generation, Listening, Marketing, Promotions, Public Relations, Relationship Marketing, Relationships, ROI, Sales, Strategy, Twitter | Comments Off on Using Twitter for Marketing and PR: Do the Pros Practice What They Preach? Perhaps you’ve heard about Chick-fil-A’s recent “oops” moment. The company fired off a cease and desist letter to a Vermont artist over his use of and trademark application for EAT MORE KALE. The chicken eatery sent the letter in an effort to protect its EAT MOR CHIKIN tagline, but the letter sparked an outcry throughout Facebook and the blogosphere. It also led to an anti Chick-fil-A petition that has already garnered tens of thousands of signatures and a CNN feature story mocking the company. Marketing professionals know that protecting a brand can be vital to its continued success. Cease and desist letters aim to persuade someone to stop brand misuse, without having to resort to a lawsuit. In the past, letters might fall on the desks of just the recipients or their lawyers. Social media now spreads many of these letters like wildfire. One overly aggressive notice could land a full-page blog post, thousands of re-tweets, and negative publicity. In some cases, this is unavoidable, and a strongly-worded letter is simply needed. In others, the public relations risk should be more heavily weighed. Research the individual or company to whom you plan to send a cease and desist notice. Who posted the content—a current or former employee or vendor, a company critic or competitor, or a well-intentioned consumer or fan? Consider how a proposed notice will be received. Think about how it would play out in the press or before a judge. The additional time researching and writing an appropriate letter is well spent. It can help to avoid a PR fiasco or positive to the receiving party, as in the Vermont kale enthusiast’s case. In some cases, you can also lower the risk that the recipient will file a preemptive lawsuit, asking a judge to rule that there is no infringement occurring. Consider whether sending a letter is even appropriate. If no action is taken, the brand misuse might not create much true harm. For instance, if it appears in a single blog post, it might be deeply buried on the website after another day or two. And if on an unpopular website of social media account, few eyes may see it anyway—again, assuming you don’t fuel the fire by unnecessarily upsetting that person. Use a tone appropriate to the situation. It should parallel the company’s level of concern, speak appropriately to the person who will receive the notice, and reflect the company’s values. Polite requests can be more effective than aggressive letters. Of course, the result that your company is seeking, and how quickly, is important. If the situation involves truly abhorrent behavior by an infringer, then a letter should more likely be sent by outside counsel. Among other advantages, this allows the company to distance itself somewhat from any harsh tone necessarily included in the letter. A cease and desist notice is almost never confidential or privileged. It is very possible that a notice will end up on the recipient’s blog or website, or in the news, and the sending company will likely have no legal recourse. Spin your wins. Use your company’s blog, social media outlets, and website to educate the public that you are shutting down frauds because you want to protect customers against malicious activity and work to keep costs down. When communicated with care, this can leave a favorable public impression, not to mention advise customers to beware of unauthorized products, vendors, social media pages, apps, and other Internet and mobile content. In short, to avoid the “fowl” attention that Chick-fil-A landed, before sending out cease and desist letters, brand owners should weigh PR risks against business and legal considerations, think carefully about whether a letter should be sent, and match the tone and language of a letter to the circumstances at hand. The opinions expressed here are those of the author only and do not necessarily reflect the opinions of the law firm with which the author is associated, or its other lawyers or clients. Google+: Where Do You Fit In? Google+ has taken the social media world by storm. The search engine mammoth has finally created a social network with some traction, and everyone is taking notice, including Mark Zuckerberg and the Facebook team. At this point, businesses should be sitting up and paying attention. But should you be jumping into the new social venture? Google+ offers features that can be highly beneficial to businesses. Features that even Facebook can’t match. For example, there is Hangouts. This feature allows for you and ten friends to video chat all at once. This is a simple, hassle-free way to video conference with clients, partners, and more. Video chatting can be more fun than a standard conference call, and it is a way for you to connect with your clients in a more personal way. Really get to know your cross-country customers. Circles is another feature that can make life easier for your business. Have circles of friends dedicated specifically for the companies that you work with. Send out messages directly to the people you want to have read them. This way, you can keep up a personal, engaging relationship through the social network without the pain of having to sift through long lists of friends. There is also Huddle. This is a way for you to chat with all the members of a Circle. You can use this for interoffice communication purposes. Keep everyone informed about meetings, time changes, new clients, and more. These three great features of Google+ can easily be used to help your office’s efforts in communication. Google+ bridges the gap from social media interaction to real-time, practical, personal interaction. From the social network, relationships can improve with clients, prospects, employees, and business partners. If you decide to jump into Google+, have a plan in place. Aggregate some influential and worthwhile Circles that can immediately give you people to connect with. Just like Twitter and Facebook, have a content strategy for when you are going to push out content and how you are going to engage your audiences. Give Google+ a try. The more people who join, the better and more effective the features will become. And with a little planning, those features can greatly enhance your business. Posted in Content, Customers, Engagement, Facebook, Google, Google Plus, Interaction, John Foley Jr., Networking, Strategy, Twitter | Comments Off on Google+: Where Do You Fit In? You wake up one morning and your back really hurts. You’ve been putting off finding a new doctor ever since you moved to town, it’s been forever since you’ve had a check-up, and now you’re paying the price. The pain is too much to wait any longer, you’ve got to find a chiropractor now. So you grab your computer, go to Google.com, and enter “back doctor” and your town’s name. You see a list of a ten chiropractors who have paid Google to be listed there and dozens of others who come up in the organic search results. But do you really want to trust your throbbing back to a complete stranger in an emergency? This scenario and scenarios such as this aren’t happening en masse quite yet, but the use of Facebook and the social graph for search and commerce isn’t far off. Think about it. Why would you possibly make a decision about a doctor, an attorney, a mechanic—or any important product or service for that matter—based on advertising or Google placement when you can make that decision based on the preference and recommendations of trusted friends? Facebook and social media have made it infinitely easier to do the latter. It’s nothing short of a gamechanger for marketers and businesses of all sizes. The great news about the new world of communications we live in today is that everybody has a shot. Build a great product, get the word out to a few people, make it easy for people to share with their friends, and you can win without spending a boatload. Just five years ago, for instance, if you went to a new restaurant that you loved, you might have shared your thoughts with a few of your friends, family, and/or neighbors. Perhaps if you really loved the restaurant, you may have raved about it for a week to as many as 10 or 15 friends. Today, you can share those thoughts with 200 Facebook friends, or 300 Twitter followers, or 150 LinkedIn connections—all with one click on your computer or smartphone! No matter what the size of your organization or client’s business, you too have the ability to follow the simple rules of social media to reap the rewards. Senior management—and anyone in a communications position for that matter—needs to know that marketing in a social media and Facebook world is not about broadcasting your message and getting the largest reach and frequency, it’s about tapping into the conversation by listening, engaging, and empowering. The loudest, biggest spenders don’t win anymore—the smartest, most flexible listeners do. Guess where I ended up staying the next time I went to Las Vegas? The Rio used social media to listen and be responsive, showing a little empathy to the right person at the right time. An ad or a push marketing-like message simply wouldn’t have worked. But the hotel staff’s ability to listen, respond, and be empathic did. The Rio essentially earned a $600 sale from one tweet—one message that got my attention and ended up being integral in my decision as to where to stay the next time I was in the city. That would be considered an excellent ROI by anyone’s standards. But the story doesn’t end there. Before I even arrived in Vegas for my next visit, I “liked” the Rio on Facebook by clicking the “like” button at Facebook.com/RioVegas, thereby letting my 3,500 friends—and the world at large—know of my endorsement of its customer-friendly practices. A few months later, my friend Erin was looking for a hotel to stay at in Las Vegas over the New Year’s holiday, and I received the following message from her on Facebook: “Hey Dave, I noticed you liked the Rio’s page. Thinking about staying there for New Year’s. What do you think?” A friend’s recommendation is more powerful than any advertisement, and Erin ended up staying at the Rio as well. Dozens of other friends have surely noticed my tweets and Facebook “likes” about the Rio and have been influenced since. So, one tweet led to one “like” on Facebook and, in fact, thousands of dollars worth of business. It used to be that happy customers tell three people about their good experiences, and unhappy customers tell ten about their bad ones. But as my experiences with the Aria and Rio hotels demonstrate, today—thanks to social media—happy customers AND unhappy customers can tell thousands of people their feelings about a company’s service or products with just a few clicks, relying on the “like” button as a virtual endorsement. The Rio leveraged this fact to its advantage, while the Aria did not. Business blogs have become critical tools in any social media marketing tool box, and they are an excellent medium to share expertise and build your business brand. But just creating a blog is not enough. You must also focus on blog SEO (search engine optimization) to ensure that it receives top placement in Google, Bing, and the other search engines. I began blogging in 2009, when I launched The Sales Operations Blog, and in 2011, I launched a second blog called Rat Terrier Mom. What do the two blogs have in common? They both appear on the first page of Google for multiple search terms and get the majority of their traffic from organic search engine links. Social media marketing nirvana! Focus and differentiate the content on your blog. There are thousands of blogs on the Internet, so if you want yours to stand out and appear on the first page of Google, it must offer something unique. Before I started The Sales Operations Blog, I did some research on blog competition and the popularity of search terms related to my content. I found that there were thousands of blogs on “how to sell” but very few on sales support. I also discovered that the phrase “sales operations” was one of the more frequently used search terms related to my topic. So before launching your blog, check out the competition, do some research on how potential readers search for your content, and attempt to focus and differentiate your blog. Include a power search term in your domain name. Google does not like cute, it likes relevant. For this reason, I chose the domains SalesOperationsBlog.com and RatTerrierMom.com. (Okay, Rat Terrier Mom is a little cute.) When choosing your domain and blog name, select a frequently used search term that aligns with your content. In my domain research, I have found that many of the most popular words or phrases alone are already taken, but if you add the word “blog” at the end, most of them are available. For example, B2Bemail.com is taken, but B2BemailBlog.com is still available. Check out GoDaddy.com to research domain options. Identify and leverage the top 20 search terms in your blog content. Use Google Adwords or a similar tool to identify the top 20-ish search terms that readers use to find content like yours, and then use this intelligence throughout your blog. This includes your post titles, post content, categories, HTML image labels, and in-post HTML tags. Note that the search terms should enhance your high-quality, interesting blog content, not actually make up your blog content. In addition to using the Google Adwords tool, monitor the “real time” search engine terms driving traffic, as reported in your WordPress dashboard. Copyblogger is an excellent resource for tips on keyword research and blogging SEO. Keep the content fresh. As part of your social media marketing plan, publish high-quality, relevant blog content, ideally once per week. There is a direct correlation to the frequency in which you publish content, your ranking on search engines, and your website traffic. Add your Twitter stream or another user’s topic-relevant Twitter stream to the home page of your blog. Every time a tweet is posted, your blog home page will get fresh content. Add a specific page to your blog that includes links to other similar, recent online content. Refer to the Other Sales Ops Articles page on The Sales Operations Blog for an example. If you focus and differentiate, choose a powerful domain name, include popular keywords in your content, and keep your content fresh (and high quality), there is no doubt that your blog popularity and traffic will climb. I wish you good luck in your adventures in blogging and social media marketing! Facebook is the bikini of the social media wardrobe. Some people choose to bare all, sharing intimate personal details, shocking photographs, and other information that is sure to make your mother blush. Then there’s Twitter—short bursts of engaging verbiage that informs or moves others to action. Consider it the wardrobe accessories or the flashy, eye-catching addition to every outfit. Now where does that leave LinkedIn? In the social media wardrobe, I would consider it the practical navy blue suit—a necessity in any professional’s wardrobe. LinkedIn currently has more than 100 million members, with a new person being added every minute. As reported on the LinkedIn website, the average user’s household income is $91,566, 63.2% of users hold a college or postgraduate degree, and 20.6% are middle management or above. I don’t know about you, but those sound like the kind of people I’d like to add to my network. Summary: I find this to be the most consistently underutilized section of the profile. I like to think of it as your cover letter. Some people may not read beyond this point, so take full advantage of the 2,000 available characters. There is a tendency to treat the Summary as a resume and focus on the past. I suggest you treat it as a presentation of your business plan. Briefly summarize specific, quantifiable accomplishments and direct the reader to a few of the most important parts of your profile. But then focus on what you are doing now, how you can help the reader of your profile, and what you plan to be doing in the future. Regurgitating your resume is unnecessary because those facts will be outlined in other sections of your profile. Ask yourself: If I have only a few minutes to share my professional story with a potential customer, client, or business partner, what would I want to say? Then use the Summary to tell your story in a friendly, conversational way. Box.net files: The key to networking, whether face to face or online, is freely sharing your knowledge and expertise with others. This builds trust. Once they know and trust you, they will want to do business with you. Box.net enables you to post PDF, Excel, and Word files to your profile. These files can be downloaded by visitors. This is a great place to post white papers, articles, company brochures, photos of your projects or products, customer testimonials, and other documents that increase your credibility and helpfulness. Google presentation/SlideShare: Let’s face it—most people would rather watch TV than read a book. These two applications allow you to post slide shows that showcase your personal expertise, presentations about your company, and/or photos of projects you have done. Video is becoming an increasingly important part of many companies’ branding efforts, and if video is part of your slide show, you can post those files here. Other applications: LinkedIn has an extensive list of applications to enhance your profile. Some are industry specific (e.g., real estate pro, legal updates, etc. ), and others can be valuable to most LinkedIn users. Connect your blog to your LinkedIn profile, use Events to find interesting professional events, or share your favorite books with your network through Reading List by Amazon. Whatever your LinkedIn strategy, there is a plethora of applications to help you achieve your goals. These additions are fun, easy, and will certainly make your profile more appealing to viewers, but don’t overlook the blue-suit basics. Include a descriptive headline and professional-quality photograph, and thoroughly outline your educational background and employment history. And don’t neglect to seek out those all-important recommendations. They provide essential outside verification of the information you have provided in your profile. While wearing the bikini and the glamorous accessories can be fun—the lasting impact and real productivity are products of the professional garb! I speak frequently about the value of social media, that’s no secret. And how we use social media is as important as how we use any other medium. Social media is now the mainstream. There’s no going back. Take the Super Bowl ads for example. Not only were they on during the game, but they also had a social media component. Now people watch TV and tweet at the same time. For those who question whether we can really do that—they said the same thing when they added radios to cars. It’s real, and it’s happening. Companies who thought they once controlled their brands are realizing that social media is the new norm. It’s not about catchy slogans—it’s about listening and being radically transparent. So what is radical transparency? It means we need to be genuine in our approach. Don’t just spew forth information. Social media is about hearts and minds, not ears and eyeballs. That said, it’s also about being who you are. If I say, “bite me” in a post, it’s because I mean it. You may disagree, or you may not like it. But for me, radical transparency is all about being true to who I am, and it’s also about being true to you. What works for me is what works for me. It will be different for you—and for everyone else out there as well. That’s why it’s called “social” media and not “one kind” media. The old rules don’t apply in the same way. For as many fans as you have on Facebook or followers on Twitter are the number of ways it can be done. And ultimately, we all have a choice in who we follow or friend. If you don’t like what I have to say, you have the choice not to follow me. And we can agree to disagree. At the end of the day, those who follow me know that I’m the big, brash guy from South Dakota who tells it like it is, really wears those cowboy boots, and loves to ride horses. I’m me, and I won’t change who I am. So be true to who you are—in social media and in business. Be radically transparent. The executive leadership team in most organizations includes individuals who have titles that begin with the letter C, such as CEO, COO, CFO, CIO, CMO, and so forth. These are people who are important and influential to the mission of their respective companies. They see the big picture. They are strategically wired. And they command respect. If you happen to be one of these individuals, you probably have a book in you. In fact, I’d be willing to bet you’ve at least entertained the idea or been told by someone that you should write a book. Getting it written, however, is another matter altogether. Time constraints—travel, round-the-clock meetings, and family and personal responsibilities—probably mean that writing a book has become just wishful thinking for you. However, postponing such an endeavor, or dismissing the value it can bring to you, is really not acceptable—even if you’re not a very good writer. You’d be surprised at the amount of help that some of today’s best-selling business authors have had in their quest to produce a book. What you need to fully understand is the impact that writing a book can have on your career. After all, you’ve already come a long way to get where you are. And now, putting your thoughts down on paper may be the only thing keeping you from reaching your next goal. For a moment, let’s not look at your position with your company. Let’s instead examine you as an individual. Like it or not, you’re your own brand. People and companies have invested in you because you bring a strong value proposition to the table. Whatever you can do to enhance and preserve your brand should always be pursued. In the corporate world, thought leaders—those people who can sell a premise, mount a charge, and have everyone follow—are often hard to come by. It’s a given that members of the C-suite have certain skill sets, or areas of expertise. If they are also well known, they are often recognized as subject matter experts. That’s where authoring a book can come into play. A lot goes into writing a book, however, so make it easy on yourself. Start simple by opening a Word document and begin getting your thoughts down as a rough outline. Spend fifteen minutes a day making notes. In six months, you’ll probably have more than enough material for your book. Or, if you blog, simply collect all your posts. And since you’re reading this post, you’re at least somewhat active on social media. So be sure to include content from your activities on Twitter, Facebook, and LinkedIn. All that will make for a great start. There are professionals who can take your Word doc, craft a final piece, design the cover and interior layout, oversee the editing and proofing, and manage all the other activities necessary for your book to appear on the shelves in Barnes & Noble stores around the country and on the Amazon.com website. Believe it or not, that’s the easy part in today’s world of print on demand. One more thought. If you take the initiative, a year from now, you could be taking copies of your book to your next stockholder’s meeting, key customer presentation, or speaking engagement. If you’re a small business owner or manager—or even a corporate marketing executive with a very limited budget—and you’ve been wondering how you could leverage social media to help grow your business, you’re definitely not alone. Almost every marketer I know is having to deal with limited financial resources in 2011, primarily because of the challenging economic times we’re facing right now. So what do you do? I’ve been active on various social media sites (including Twitter, Facebook, and LinkedIn) since early 2009 and have been amazed at the benefits and opportunities that activity has brought to me and my company in a relatively short period of time. As Jessie suggested, I didn’t have to invest very much of my marketing budget to reach my social media marketing goals, but I did spend a lot of time developing strategy, content, and most importantly, relationships. I have to say it has been worth every minute. Once you’ve selected the right social media channels and sites for your individual situation, you’re ready to join the discussion, build relationships, and ultimately reap the benefits. Like many of you, I sign up for the free influence-measuring sites. I am skeptical of all of them but check out my scores and those of online friends. I am well aware that I am no Justin Bieber (Klout score 100) or Barack Obama (Klout score 87) in online influence. But I take comfort if I am near the scores of tweeters I admire, such as @CKBurgess, @KentHuffman, @ChuckMartin1, @DavidAaker, and @WareMalcombCMO. I find early efforts to measure influence interesting, but I am concerned that parties are taking these fledging measures seriously and making decisions based on them. Some tweeters choose who to follow by their influence score. A recent Wall Street Journal article discussed the importance that businesses are assigning to Klout scores: marketing freebies and even job offers may be tied to Klout scores. Although I am not concerned that my tenure committee will pass me over for Justin Bieber or Britney Spears, I worry whether the influence of the influence measurers may impact SM communities. If tweeters believe that their online status, likelihood of being followed, and even employability may be affected by these measures, they will adjust how they act. A well-known management dictum notes that nothing can be managed until it is measured. The relevant corollary is that what is measured will affect behavior: bad metrics can lead to bad behavior! Will the clout of Klout cause loutish behavior in social media? @Econsultancy summarized the flaws of Klout’s measures in a recent blog post. And in one study by @Adriaan_Pelzer, a bot achieved a 51 Klout score in 80 days simply by 1) tweeting gibberish once a minute and 2) not following back new followers. Senior officers at Klout responded to that study (and similar ones) by noting that they were working on algorithms to spot bots. Klout proposes to attack the symptom head on (who wants to be fooled by a bot?) but downplay issues of the metrics themselves. What kind of “community” will Twitter be if everyone follows these “winning” behaviors? Do you judge tweeters by quantity of tweets? Is it optimal to have 10 times as many followers as people followed? Phillip Hotchkiss, Chief Product Officer at Klout and a serial start-up entrepreneur, commented on an earlier post I wrote on this issue. His most interesting observations are that Klout’s metrics are always being modified to measure influence, and that Klout is trying to differentiate between “bad bots” and “good bots.” It is good to know that Klout is constantly evolving in pursuit of good influence measurement. Phillip’s “good bots” are a little scary. Maybe there is a good science fiction story there! Be wary of even well-intentioned measurers. For example, many researchers believe that U.S. News & World Report’s college rankings hinder educational innovation by focusing on reputation and resources that please faculty, rather than cost/benefit measures that apply to most services. Similarly, focusing on factors such as tweets that generate action (regardless of content) and on follower/followed ratios could impair Twitter’s evolution. Be wary of these developing measures. Do not let the measures affect your behaviors or enjoyment of social media. Do not make hiring decisions based on Klout, unless you honestly believe that Justin Bieber is the perfect 100 and the most influential person online! And please, please don’t start tweeting every three minutes! Any business owner, from the Fortune 500 to the corner liquor store, has heard about the tremendous potential of social media for Internet marketing. However, although everyone acknowledges and accepts that social media has great potential, and many of them know they should be involved, few people understand the specific, practical marketing applications for social media sites. In this four-part blog post, I’m going to profile one such social media site: Facebook. I’ll also share some data that I’ve aggregated through my research. Keep in mind that there are many third-party applications that make using Facebook easier that I’ll profile as well. Facebook is the 800-pound gorilla in the social media marketing world. The brainchild of Harvard geek Mark Zuckerberg, Facebook now has more than 500 million users (yeah, that’s about seven percent of the population of the entire planet) and has created a phenomenon of unprecedented scope and scale. Hundreds of millions of people spend huge segments of their daily lives on this single site, interacting with friends, sharing content, playing games, and scheduling or organizing their social lives. It’s become a venue for collective action, knowledge, and an incredibly detail-rich (if personally detached) social environment. Users willingly share an incredible amount of personal information, and they greatly trust product and service recommendations made by members of their network. Facebook has also created a incredible scale of off-site integration. Although many social sites—such as Twitter, Digg, Buzz, and others—have buttons that allow you to share content, Facebook has created a phenomenon with its social plug-in applications. Facebook’s Developers Guide is probably the best way to find out more about what options it offers and how to install them. If you haven’t already, go to the Facebook site and create a personal profile for yourself.